A review of the Golestan Palace Library and Archive in Tehran, Iran. My dissertation research focuses on the social, cultural, and spatial construction of the women’s quarter of Nasser al-Din Shah’s court, often referred to as his harem, which was located in Golestan Palace. In particular, I am interested in examining the spatial and material realities of the residence of the Golestan harem—estimated to be between 800 and 1,200 wives and female relatives, as well as various classes of migrant laborers, servants, maids, slaves, and eunuchs. As such, the Golestan archives and its holdings have been a key site for my archival research during my two trips to Iran in 2013 (between January and May) and in 2015 (between January and April). The Golestan archives are located in central Tehran, in what was once the historical core of the city and steps away from the Tehran bazaar. 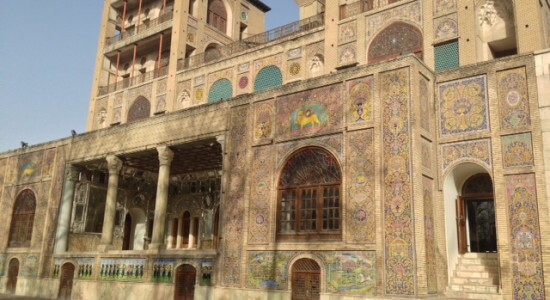 Housed in the Golestan Palace Museum, the archive is most notable for its collection of photographs, paintings, and manuscripts which chronicle the late Qajar era, and in particular, the period of Nasser al-Din Shah’s reign (1848-1896). Originally built during the Safavid dynasty, Golestan was the official royal residence during the years of Qajar rule, but under Nasser al-Din, the palace underwent significant expansion and is widely considered a central part of his legacy. The museum is generally touted for being amongst the best examples of Qajar architecture and for housing a large number of artifacts from the era. It also houses a research unit with an extensive archive. The museum’s archival holdings are comprised of a manuscript library (kitābkhanih-yi nusakh-i khaṭṭī), a photograph archive (markaz-i asnād-i taṣvīrī), a documents archive (markaz-i asnād-i khaṭṭī), as well as a small library. The museum also has a gallery which holds several paintings from the original Qajar collection (in particular paintings of the royal court), and a selection of European paintings which were mostly accumulated during Nasser al-Din’s reign. In order to get access to the archives, you must bring a signed letter from your academic institution which outlines your area of research and the resources you will need to use at Golestan, one form of photo ID, as well as a personal letter of request that outlines, in as much detail as possible, the list of materials you would like to access. If you are an Iranian citizen, you must have a copy of your National Identity Card. The archival staff prefer that all documents have a Persian translation attached to the original. During both of my stints at the Golestan, the entire registration process took between one and two weeks, although you should make sure you are not initiating the process close to or during the Iranian New Year holidays as the archives are closed for two weeks. Access to the materials at Golestan varies depending on the office with which you are working. In my experience, the photo archives and painting departments are the easiest units to work with. The documents archives unit is more challenging, and it is nearly impossible to access the manuscript holdings. It is said that there are currently more than 3,200 items in the collection of manuscripts – which include classics such as Shahnameh, One Thousand and One Nights, as well as several travelogues and memoirs – and that Nasser al-Din’s hand-written notes can be found in several of the volumes in the library. Unfortunately, as of yet, none are available for viewing to most researchers. Some materials have been scanned and, according to Golestan’s policy, upon receiving permission from the administration, one may view digital copies. However, this has proven to be a challenging task. Despite applying for access to the manuscript archives during my two separate research stints, I was not given permission and I have heard similar stories from other researchers. According to the Golestan website, the administrators hope to have a more user-friendly reference service for this section of their holdings available to researchers in the future. The documents archive of Golestan also lacks any form of catalog and search engine. Despite housing a large body of documents including financial records, maps, and letters, it is also unfortunately a frustrating experience trying to access these records. The process for viewing these sources involves speaking to the administrator in charge and providing as much detail as possible about one’s area of research. She then looks into documents she deems pertinent to your research and makes a selection which she puts onto a USB drive. While I was able to get a number of documents through this process, including a useful map, none of the documents were cataloged or came with any information. As such, it is left up to the researcher to decipher what she is looking at and situate it. Luckily, many of the letters and financial documents have dates, signatures, and stamps on them, so it is still useful to accumulate items from this section. The most user-friendly section of the Golestan holdings is the photo archives. There are approximately 9,000 photographs in these holdings, although only a fraction of these are readily available to researchers. Still, it is an impressive collection, which is organized according to albums which were made by the Qajar court, and often, by Nasser al-Din Shah himself. Many of the photographs give insight into the daily life of the residents of the court, including an incredible survey of harem photographs that depict the women who resided in the court, the many trips that the royal family took—most notably, Nasser al-Din’s infamous hunting trips—as well as portraits that depict the court hierarchy and the various characters within it. Many of these photographs were taken by Nasser al-Din himself and have his hand-written notes permanently marked on them. The first page of each album also has information pertaining to its content including date, name of photographer, and basic description. The staff of the photo archives are both friendly and knowledgeable, making it the most accessible unit of the archives. Researchers are able to flip through replicas of the original albums, make a selection, and put in a letter of request to acquire copies of the images. Master’s students are allowed twenty-five images and Ph.D. students are allowed thirty-five, although one may make a request for extra photos based on being a student from abroad. Once the selection and request process are completed, you will receive digital copies of the photographs in a few days. Each copy of a photograph costs 1000 toman (roughly thirty U.S. cents). All materials that are accumulated with proper permission from the Golestan archives may be reprinted as long as credit is given to the archive. Staff also encourage scholars to submit a copy of all published works to the Golestan library for their record keeping. I found these records themselves to be a useful resource that allowed me to broaden my understanding of the work being done by scholars from across the world on the Qajar period. Among the most enjoyable aspects of this archive is that the building is located in the heart of the museum and you can spend time during your breaks in the beautiful garden or visit the many historical buildings on the grounds of the museum. Most units of the archive are open Saturdays to Wednesdays, from 9 a.m. to 2:30 p.m. The archive is located steps away from the Panzdah-e Khordad subway station and Tehran bazaar where you will find plenty of food options. There is no formal dress code, but you must obviously abide by the Islamic Republic’s dress code during your visits. More information is available on the Palace’s website (in Persian and English). Image: Golestan Palace in Tehran, Iran (photograph by the author).